Should you take the 11-Week Online TEFL course or the 4-week In-Person course instead? Here are 4 key factors to consider when choosing your path to TEFL Certification and teaching English abroad! So, you want to teach English abroad and enjoy the international adventure of a lifetime? Fantastic. And you want to receive the training you need to become a great teacher and to gain a qualification that will enable you to get hired in Europe, Latin America, Asia and/or the Middle East, right? Perfect. There are hundreds of thousands of opportunities for teaching English overseas and nearly any English speaker can get hired to teach abroad, even without an education degree or prior teaching experience. However, schools looking to hire English teachers want to hire trained teachers, not just somebody off the street who happens to speak English. That’s why earning an accredited TEFL certification is key if you want to avail yourself to the best possible job opportunities, whether they be in Spain, China, Argentina or in any other country. Read more about accreditation and standards for TEFL certification. But which TEFL course is best for you? Should you go for the Online TEFL Certification Course option or would it be better to take a 4-week course in-person? Naturally, you will need to consider your finances. Are you on a tight budget to get overseas? Do you need to work and save money before going abroad? Do you want to have extra spending money in the country for some fun before or after your training class? a) The tuition for a 4-week in-person TEFL course in one of 25 locations around the world will typically cost $ 1,599 to $ 2,499 ($ 1,899 on average) depending on location. (Real estate prices and local professor salaries are the major factor for the price range). b) Housing & personal expenses for on-site courses: Unless you are taking a course in-person in your home city, you will also need to pay for housing, food and expenses if you take a four-week class, which usually run $ 800 - $ 1,500 for a month depending on where you are taking your TEFL certification course. a) Tuition for the ITA 170 hour online course is $1,399. b) Savings Tips: Staying with friends or family can cut down on housing costs. Also, if are in the U.S. or Canada and you want take an in-person TEFL course, but don't want to pay for extensive travel costs, consider taking a TEFL Course in North America, like the four-week Chicago TEFL Class. DIFFERENCES IN COSTS: The 170-Hour Online TEFL Course option vs Onsite will typically cost $500 - $1,000 less (sometimes more) than traveling to a foreign country to take a 4-week course onsite. For more on TEFL Class tuition, check out all ITA Online and Onsite course dates & tuition costs here. Interviewing for teaching jobs in advance from your home county - Are you planning to teach in a specific location or are you open to options worldwide? There are many jobs in the Middle East and in major Asian markets like Korea, Japan, Taiwan and China that typically require that you interview in advance from home and line up your English teaching job prior to heading overseas. There are also some countries in Europe where you can apply for jobs in advance from home, including Russia, Turkey and some other countries in Eastern and Central Europe. A limited number of language schools in Latin America may also interview and hire you from your home country, though most schools in this region hire teachers locally. Taking the International TEFL Academy online TEFL certification course is a great option when you are planning to interview for jobs in the countries listed above. If you live in the U.S. or Canada, another great option is to take a TEFL certification course in North America like the four-week Chicago TEFL class, which is given at International TEFL Academy headquarters and includes special workshops on job markets and the opportunity to work with job search advisors in-person face-to-face. Interviewing locally face-to-face in the country where you want to teach - Taking an in-person class in one of our 25 locations abroad like Barcelona, Buenos Aires or Ho Chi Minh City (Vietnam) can make a lot of sense if you seek to teach English in a country where most schools interview new teachers locally face-to-face. It will put you right on the ground where you can interview and begin teaching right out of your course, and the staff on the ground will assist you with your job search. It is also a great way to get acclimated to a new country and culture as you complete your TEFL training. That said, if you are on a budget and want to teach in location where most schools interview in person, you can certainly take an online class and use the money you save to fund your travel and other start-up costs required to support yourself while you interview and get a job until you receive that first pay-check. This requires traveling to a another country without having a job lined up in advance, but if you are properly prepared and time your arrival to major hiring seasons, there is no reason why you won't be successful. Over 1,000 International TEFL Academy graduates each year earn their TEFL certification online or by taking an onsite course in Chicago, for example, and then they travel to countries like Spain, Italy and Argentina to interview. Virtually all of them are able to get jobs because they hold a top-level TEFL certification and receive comprehensive Job Search Guidance that enables them to find jobs and interview upon arrival in their new country. 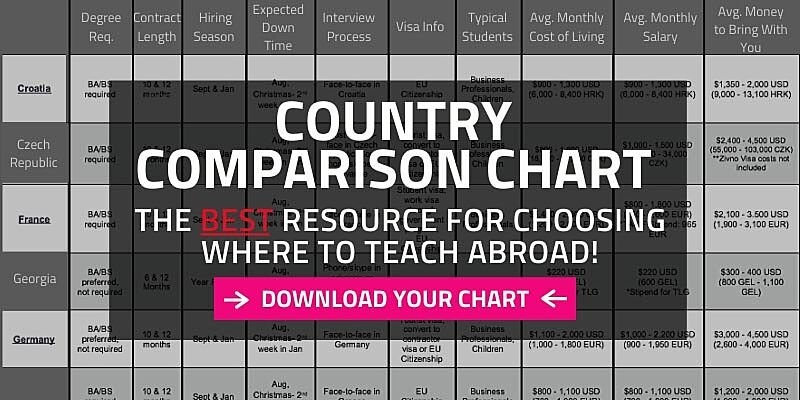 To learn more about interviewing and hiring practices in more than 50 countries around the globe, check out a Country Chart. Looking to head abroad as soon as possible or in 3-6 months, or even farther out? In-person TEFL classes will be completed in just 4 weeks compared to 11-13 weeks for online TEFL classes and represent the fastest way to get your accredited certification. The in-person classes are full-time and intense; it's basically boot camp for English teachers and should be considered a full-time commitment for those 4 weeks (don't try to tend bar at night or take other classes). The online class is completed part-time, typically 10-12 hours per week over 11 weeks, which makes it ideal for full-time students who want to knock out their certification and line up a job prior to graduation or for those who are holding down a full-time job. When looking at your calendar, if you want to be abroad in 3-6 months, the online class, or an onsite course in your home country is often an ideal choice. Remember, you will receive Job Search Guidance and can begin the job search and interview process during the course. In fact, it is common for students to line up teaching jobs before their course is completed. How do you prefer to receive your training? Are you a hands-on learner, seeking the definitive structure of a full-time, face-to-face class? Perhaps you learn better when you are already in a new country immersed in and acclimating to a different culture. Both the onsite and online class offer an important level of interaction between you, your classmates and professors. Onsite TEFL classes are typically capped at 10-12 students. The limited number of TEFL students in each class provides for more personal attention from your professors and a hands-on interactive learning experience. All onsite classes also incorporate live practice teaching with local ESL students. The 170-Hour Online TEFL Class is comprised of 20 students from around the world and incorporates live webinars and lectures, in addition to a 20-hour practicum (live practice teaching) that will provide you with hands-on teaching experience, even though it is an online class. The class was designed to facilitate interaction amongst all students. Remember, all TEFL Certification courses offered by International TEFL Academy will provide you with the skills and an internationally accredited certification you need to get hired to teach English in dozens of countries around the globe. To learn more and to discuss your options and questions, give us a call at 877-610-1337 to speak with an expert advisor. Then pick your course preference and explore the globe! What are hiring seasons for teaching English abroad? Does International TEFL Academy Provide Job Placement Assistance?